For "The Gizoid", see Emerl. Gizoids are combat robots used by the Nocturnus Clan. In the ancient world, gizoids were used by the technophilic echidnas as advanced infantry in their wars of conquest. Initially, gizoids were known from only a single specimen, Sonic Battle's Emerl, who was studied by Professor Gerald Robotnik. However, in Sonic Chronicles: The Dark Brotherhood, it is revealed that the robots represent an entire manufacturing line of military ordinance. The Nocturnus continue to utilise gizoids inside the Twilight Cage. Artificial soldiers were developed by the Nocturnus around four thousand years prior to Sonic's time, as Imperator Ix's people vied for control of the ancient world against Chief Pachacamac and the Knuckles Clan. Marching out of the factories within the Nocturne citadel, the prototype Gizoids fought at the forefront of the Nocturnus armies, and (according to Ix's hyperbole before the final boss in The Dark Brotherhood) turned the tide of the war against Knuckles' ancestors. Gizoids' strength lay in their ability to flawlessly mimic their enemies' attacks, allowing them to become more skilled in combat with every vanquished opponent. Indeed, in the Nocturnus' ancient language, the word gizoid means "everything" (Gerald's Journal #3, Sonic Battle), referencing the robots' ability to copy any technique or incorporate any weapon into their own systems. After Perfect Chaos obliterated their rival brethren, the Nocturnus Clan enjoyed a free (if brief) reign over Sonic's world. Robotics research and development didn't stop during this time; the pinnacle of Gizoid science in the ancient world came in the form of Emerl, a robot with the ability to absorb Chaos Emeralds. Thousands of years later, and a whole dimension away on the Kron Colony, Nestor the Wise conjectures that it was precisely this breakthrough development which attracted the attention of Argus, and led to imprisonment of the Nocturnus echidnas in the Twilight Cage. Rightly or wrongly, the Nocturnus were removed from Sonic's world shortly after Emerl's creation. Excluding Emerl, every single Gizoid under Nocturnus control was transferred to the Twilight Cage in the Argus Event, along with the Nocturne and (apparently) most - if not all - of Nocturnus civilization. Imperator Ix continued to use the robots as the echidnas subjugated the other races of the Cage, and advanced Gizoid models remain a central part of the Nocturnus army when Sonic and friends arrive there during Chapter 7 of The Dark Brotherhood. Gizoid - The basic combat robot employed by the Nocturnus army throughout the Twilight Cage in The Dark Brotherhood. Has 250HP, and can use any and all Nocturnus and player-character POW moves. Gizoid Mk. II - A slightly stronger version of the basic Gizoid, with 340HP. Gizoid Centurions - Advanced Gizoids that ambush Knuckles and Shade's party on the Nocturne. Gizoid Centurions have a protective, starry shield around them which renders the robots totally impervious to attacks. Only Tails' quick thinking enables the heroes to disable their shields, using a specific sonic frequency. Gizoid Guardians - Elite bodyguards of Imperator Ix, only seen during the final boss fight of The Dark Brotherhood. These robots have a single, wide wheel in place of their feet, and attack using a massive polearm and a signature POW move, 'Crippling Arc'. Prefect Charyb - One of the two Gizoid Prefects of the Nocturnus army. Charyb fights Sonic and Tails in an underwater lair as a 700HP sub-boss for the Nocturne. Prefect Scylla - The other Gizoid Prefect of the echidna armed forces. Scylla is somewhat mentaly unstable, and will often laugh crazily at the end of his sentences. Scylla fights Knuckles and Shade as another sub-boss (again, with 700HP) on the Nocturne. Emerl - Said to be the strongest Gizoid ever created by the Nocturnus Clan. After somehow managing to avoid imprisonment in the Twilight Cage, Emerl weathered four thousand years following his masters' exile to eventually be found in an archaeological dig by the United Federation. Emerl's gradual re-awakening and absorption of the Chaos Emeralds is the basis for the plot of Sonic Battle - at the end of which, the robot is destroyed. E-121 Phi - After studying Emerl before the opening of Sonic Battle, Eggman reverse-engineers the Gizoid's mimicry capabilities, enabling him to produce his own series of move-copying robots: the E-121 Phi line. Powered by Chaos Emerald shards, these robots are recurring enemies throughout the game. Gemerl - After Emerl's destruction in Sonic Battle, Robotnik used the Gizoid's data (and wreckage, according to some sources) to construct Gemerl, who functions as a recurring enemy (and final boss) in Sonic Advance 3. Gemerl seems to lack the typical Gizoid penchant for move-copying. 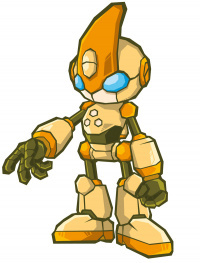 At the end of the game, he is discovered by Cream and repaired (into an apparently 'good' character) by Tails, making this robot some sort of tripartite fusion of Nocturnus, Eggman, and vulpine technology. This page was last edited on 7 May 2012, at 21:52.